338 pages | 77 B/W Illus. The Scottish economy is at the heart of contemporary constitutional and public policy debates. This substantial new edited collection, the first comprehensive and authoritative analysis for more than 60 years, is a timely update on the classic volume of the same name edited by Sir Alec Cairncross in 1954. It is data rich, and offers links to updatable data and leading indicators of the Scottish economy including measures of public finances, distributional evidence and growth. Readers will find a series of easy to follow chapters covering the Scottish economy from every angle – oil and gas, health, education, finance, rural Scotland, inequality, climate change, gender and work, housing, infrastructure and cities. Each sector-based chapter explores the main issues, draws out key empirical facts and considers policy challenges that lie ahead. This book includes: an historical account of the development of the Scottish economy; the trajectory of economic policy in Scotland; reviews of the current fiscal position and the wider economic landscape; and also an intriguing insight into the emerging distinctive approach to Scottish public policy. 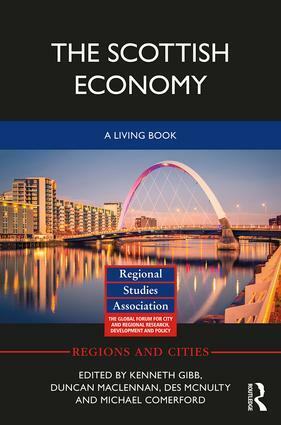 This book brings together evidence and high quality research by experts on the Scottish economy in a politically neutral, accessible and non-technical way. The volume will assist readers in navigating their way through the many political debates about constitutional and economic futures that are underway in modern Scotland and the UK. A website also exists to accompany The Scottish Economy - www.scottisheconomy.scot. In today's inter-connected world, it makes sense to have a book on the Scottish economy supplemented by online access to important data, information and evidence as a means of keeping material current. Kenneth Gibb is Professor of Housing Economics and the Director of Policy Scotland, both at the University of Glasgow, UK. Duncan Maclennan CBE FRSE is Professor in Public Policy at the University of Glasgow and leads Policy Scotland’s work on cities. He is also Professor in the School of Management at St. Andrew’s University, UK. Des McNulty is Deputy Director of Policy Scotland and Dean, Public Policy and Knowledge Exchange at the University of Glasgow, UK. Michael Comerford, formerly of the University of Glasgow Urban Big Data Centre, now works as a data scientist for Agile Solutions, a Glasgow based information management consultancy, UK.